I must say, I don’t usually handle winter very well. In the past I have tended to overeat, do less, and snuggle up under the blanket with my 3 Jack Russell’s. But this winter I have been determined to not put on weight. We are heading to Scotland next month and I want to be able to eat anything I feel like, and drink a few wee drams each day, without worrying about my clothes not fitting me when we get back. The best way to do this is to make sure my body is not sluggish. Thermogenics has a way of speeding up metabolism and usually we see this principal in the form of supplements, such as fat burners. But, you can go the healthy route and incorporate ingredients into your diet that will warm you up from the inside. Black pepper, coconut oil, green tea, cayenne, cinnamon and ginseng all have thermogenic abilities. I have increased the amount of pepper we use in our seasoning and I am cooking more and more with coconut oil as I love the flavour it imparts, especially when I fry mushrooms. For our every day soup I am using cayenne and turmeric to add both flavour and keep the common cold at bay. I also want to have treats in winter without feeling guilty and so when I was asked to test a recipe for coconut banana loaf that uses these warming principals, I did not say no. Perfect healthy treat, with a distinct coconut flavour. I would not mind a few wee drams a day! And many slices of that loaf. Are you familiar with Ayurvedic herbs and medicine, because all these warming up elements is discussed. I recommend looking into it. this looks so moist! I love baking with coconut. Hi Tandy, I love cooking and baking with coconut oil too, especially mushrooms. Beautiful banana coconut loaf. 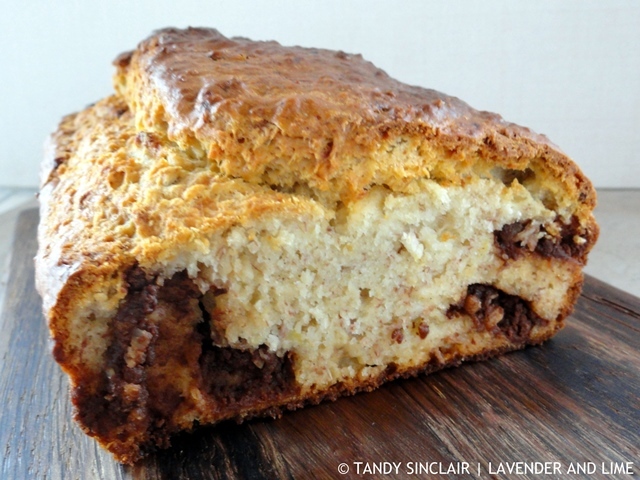 Banana bread is a favorite at our house, but I have not experimented with addition of coconut. Sounds like a tropical paradise! Have just started to use coconut oil so I look forward to trying this! This loaf looks absolutely amazing. I may not be a huge fan of coconut, but this mouth loaf is making me reconsider that stance lol. This looks delicious. It looks and sounds wonderful. I love coconut & banana together. I’ve had banana bread many times but never with coconut. This looks incredible! I struggle with putting on weight in the winter too. Too many parties, too much baking and flour. I love this recipe and now am going to get my own coconut oil. Snuggling on the couch with my dachshunds is still important though!! Coconut banana load looks amazing, Tandy. And, I love that it’s is easy and delish! No one can say NO to this loaf. Super YUM! Jan, I keep promising myself I will walk more, as one of the puppies needs to lose weight! When I am healthy, I am active all winter and ANY day it is not above 70. I can handle it as high as 80 if it cools off later. I love the winter months Not as much here in Florida. Colorado was a good fit for me. Even the summers were USUALLY nice. Love the recipe. Saving it for me. Hugs Tandy.